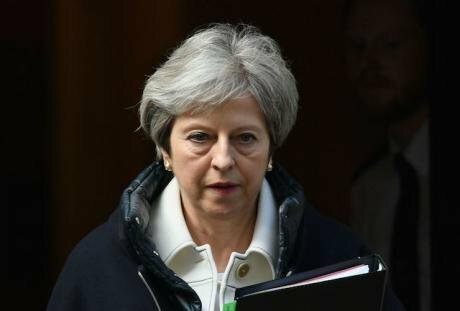 Prime Minister Theresa May leaves Downing Street to make a statement to MPs in the House of Commons over her decision to launch air strikes against Syria. Stefan Rousseau/ Press Association. All rights reserved.Theresa May justified the air strikes on Syria last week in humanitarian terms. She is right, of course, to draw our attention to the humanitarian plight of Syrian citizens at the hands of the Syrian regime. But the justification of the strikes under international law is highly questionable and it is very difficult to identify what humanitarian benefits, if any, have been achieved by the strikes. It is important to expose the hypocrisy of the Government’s humanitarian argument and the dangerous precedent this sets for future military interventions. At the same time, it is essential to ask what can be done to alleviate the suffering in Syria and what a genuine humanitarian intervention might look like. Nevertheless no such doctrine has been formally incorporated into international law and there has been widespread resistance to the notion that the role of the UN Security Council in authorising the use of force can be overridden. The UN Charter prohibits the use of force except in the case of self-defence or when authorised by the UN Security Council. In the aftermath of the war in Bosnia, the genocide in Rwanda and the NATO strikes in Kosovo and Serbia without Security Council mandate, global public concern led to the formulation of Responsibility to Protect that was adopted by the General Assembly in 2005. The Attorney General’s three tests do, to some extent, resemble the six criteria put forward by the International Commission on Intervention and State Sovereignty… But these were intended as the basis for decision-making by the UN Security Council. 'While there is no universally accepted single list, in the Commission’s judgement all the relevant decision making criteria can be succinctly summarized under the following six headings: right authority, just cause, right intention, last resort, proportional means and reasonable prospects.' Right Authority, of course, refers to the UN Security Council. General Assembly Resolutions are not legally binding. The Assembly’s failure to endorse action not authorised by the Security Council does indicate that there was not international community support for such action, nor sufficient state practice to sustain a rule of customary international law in this respect. Of course, the Government might have argued that the intervention was legitimate if not lawful. This was the argument of the Independent International Commission on Kosovo, that famously concluded that NATO’s intervention in former Yugoslavia in 1999 was legitimate, because all the Albanians expelled from Kosovo, were able to return to their homes, but not legal since the intervention was not authorised by the UN Security Council. But even if we accept that that there is a legitimate but not legal case for humanitarian intervention in the case of Syria, it is very hard to argue that the strikes constitute a humanitarian intervention and have actually relieved humanitarian suffering. The Government’s argument is that the use of chemical weapons is a war crime and a crime against humanity and the legal opinion lists the distressing occasions on which chemical weapons have been used. The Government argues that the air strikes ‘alleviate humanitarian distress by degrading the Syrian regime’s chemical weapons capability and deterring further chemical weapons attacks’. But this is highly questionable. First of all in the recent attack on Douma, it is known that chlorine was used, as on many previous incidents. Chlorine is in widespread civilian use and cannot be destroyed. The other chemical that has been used is the nerve agent Sarin. The declared stocks of chemical weapons were destroyed by the OPCW (Organisation for the Prohibition of Chemical Weapons) after Syria signed the Chemical Weapons Convention in 2013. But it is rather easy for the regime to hide small amounts in, say barrels, for an attack similar to that which took place in Douma and it is very unlikely, especially given the amount of warning that was provided, that these small amounts have been eliminated. In other words the strikes are unlikely to have degraded the Assad regime’s chemical capability by much if at all. In other words the strikes are unlikely to have degraded the Assad regime’s chemical capability by much if at all. Have the strikes deterred future attacks? It is possible. But chemical weapons are not the only cause of humanitarian suffering in Syria. Syrians are the victims of conventional bombing, forced starvation from sieges, widespread arrests and torture and of further harms through displacement. It is well-known that prohibiting something in international law can often represent implicit permission for actions that are not prohibited. For example, International humanitarian law prohibits the targeting of civilians but condones the targeting of combatants – this is the justification for drone attacks. Some half a million Syrians have been killed in seven years of wars, the vast majority from regime attacks, and half the population forcibly displaced. The message to the Syrian regime of the air strikes is that the west will not tolerate the use of chemical weapons but, by implication, the regime can continue its barbarous behaviour towards its population with impunity. Moreover the refusal of the UK government to accept more than a handful of Syrian refugees calls into question its commitment to helping the Syrian people. The west will not tolerate the use of chemical weapons but, by implication, the regime can continue its barbarous behaviour towards its population with impunity. There is a fundamental contradiction between the goal of humanitarian intervention and the means – air strikes. Air strikes are also a cause of humanitarian suffering – they cause so-called collateral damage and they spread fear. This contradiction was evident in both the NATO intervention in former Yugoslavia in 1999 and the intervention in Libya in 2011. In the case of Kosovo, this was explicitly claimed to be a humanitarian intervention to stop the ethnic cleansing of Albanians by the Milosevic regime. In the end Milosevic capitulated and the Albanians were able to return to their homes. However, ethnic cleansing was speeded up under the cover of bombing, hugely exacerbating the polarisation between Kosovar Albanians and Serbs and the intervention was followed by revenge attacks and empowered criminalised armed groups on the ground who became the main political actors after the war. Moreover the bombing risked the lives of the very people that were supposed to be protected – some 2000 civilians were killed, including fleeing Albanian refugees. In the case of Libya, which was approved as a Responsibility to Protect operation by the UN Security Council, NATO bombing did prevent an imminent attack by the regime on Benghazi and it also destroyed Gaddaffi’s military apparatus – thus it could be argued that the overall scale of killing has been less than in Syria. Collateral damage was probably less than in Kosovo because of improvements in precision, although we do not know the level of civilian casualties. However, the goal of the intervention shifted from humanitarian to the goal of regime change and in the ensuing conflict in which NATO supported armed rebels on the ground, many civilians were killed. Moreover the empowerment of armed groups has resulted in long term violence, disorder and instability. What does a genuine humanitarian intervention look like? So what would a genuine humanitarian intervention involve? The problem with the terms ‘humanitarian intervention’ and ‘responsibility to protect’ is that they focus on the right of outside powers to intervene. The term ‘human security’ rather implies the right to be protected. A human security approach is about protecting people rather than defeating enemies; it is more like policing than war fighting and the means need to be tailored appropriately. It might involve the use of military forces but along with police, aid workers, medical staff, mine clearance teams and so on and military force would be used in very different ways according to the specific context. So what might this mean in the case of Syria? First of all there is a need to change the global conversation. At the moment the Syrian conflict is debated in geo-political terms and there is very little discussion of the needs of the Syrian people. In contrast to, say, the conflict in Bosnia, there has been very little international public solidarity with Syrians. Diplomacy should focus on the humanitarian situation and the need for civilian protection rather than or as well as finding a political solution. This change in conversation should be expressed at the diplomatic level as well as the wider public level. Diplomacy should focus on the humanitarian situation and the need for civilian protection rather than or as well as finding a political solution. Seven years of talking about a political solution have produced very little. The talks are very complex because they involve so many factions and armed groups, many of them in exile and with external ties, and despite the efforts of the UN Secretary General’s Special Representative Staffan Di Mistura to involve women and civil society they tend to neglect actual political actors on the ground. Focusing on the humanitarian situation means negotiating among the outside powers on such issues as how to enforce a ceasefire, end sieges, provide protection mechanisms for civilians and ensure humanitarian access. There must be efforts to increase the UN presence inside Syria especially in areas where local cease-fires have been negotiated. Secondly, there must be efforts to increase the UN presence inside Syria especially in areas where local cease-fires have been negotiated. In particular, the UN Security Council should authorise the deployment of a larger UN mission to Ghouta with a stronger mandate, in addition to the OPCW mission. The ceasefire in Ghouta was the result of a combination of military and local pressure and many civilians have remained but are vulnerable to the regime. Russian/Chechen military police went in to provide protection as the armed opposition departed. A UN mission would be mandated to protect civilians and prevent violations of human rights, monitor the ceasefire, ensure the independence of the OPCW mission, keep the extremists out of Ghouta, demobilise and reintegrate those armed groups that remain in Ghouta, ensure citizens participation in whatever administration is established, and document human rights violations and prevent looting. Similar proposals should be put forward for other areas where local cease-fires have been or are being negotiated. It is worth noting that according to one count some 44 local cease-fires were negotiated in the last year – many of them fragile and vulnerable to regime pressure. The main obstacle to this approach is the Russian veto in the Security Council; there could be also be resistance from the US in relation to the areas recently liberated from ISIS control. However there are reasons why Russia might be persuaded. First, it lacks the capacity for policing on the ground (it has only 300 police in the whole of Syria) and, second, it is interested in reducing and side-lining the role of Iran. There is also a precedent In the case of Aleppo. The UNSC authorised a UN monitoring mission to go to Eastern Aleppo,(UN Security Council Resolution 2328 2016) but by the time it was authorised it was too late as nearly everyone had left the part of Aleppo which was then under siege. Similarly the US is unwilling to deploy personnel on the ground and is reliant on Kurdish forces and private security contractors. Paradoxically, it actually strengthens the role of Russia who came to be seen as the regime’s protector, shielding regime aircraft on Russian bases. Finally of course, a humanitarian approach would mean welcoming and helping refugees as well as continuing support to internally displaced persons inside both regime held and opposition controlled areas.